solution for the Ibasso D10. But after the mod my friend thinks that this solution is good enough. The creative X-Fi implementation of the USB to audio is one of the best in the industries. Certainly better then the EMU 0404, Xital DG2, PCM2906 (used in the D10), PCM2702E (used in the predator). These are without ASIO and limited to 16bit/48Khz. The USB interface on the X-Fi support USB2.0, ASIO with buffering and 24-Bit/96kHz. The week link in the X_Fi lies in the DAC and the Audio amplifier. The DAC section it uses the Cirrus Logic 4361, Which is still better than the PCM2702 (used in predator) but not as good as the WM8740 (used in D10). Comparing only the USB and DAC combination the X-fi would beat the Predator and the D10. But the Amplifier section is really basic and horrible on the X-fi. So I applied the following modification. B. Added WIMA capacitors in parallel to the bypass cap from the DAC to the Amplifier. C. Ceramic cap for Power Supply. D. Nichicon Fine-Gold to replace the stock output decoupling cap. There are 2 no of Wima Cap on the underside of the PCB. E. Sanyo OS-CON for the Power supply coupling for Audio Section, there is one more for the Digital section, not shown. Because of the simplicity of the amplifier section this mod is only suitable for IEM and not for full size headphone. The complete solution is less than SGD$100 or US$75. 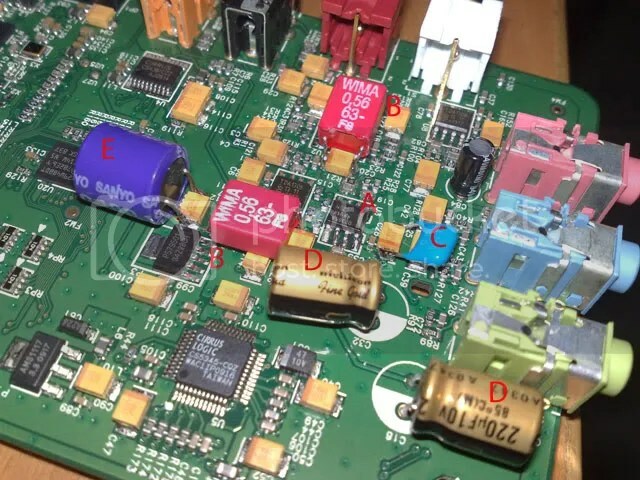 Im going to replace the main 16v 220uf capacitor on my x-fi xtreme music soundcard, will doing so help with the cold boot issues these cards suffer from? Yes indeed, thats what the problem is with these cards, the main filter cap is a jamicon which are know to go bad in a very short space of time and cause the known boot problem.